As you may have heard, it was recently announced that the next version of the Safari browser for macOS and iOS, Safari 11, will support WebRTC – the real-time video and voice communication technology that Gruveo is built on. Today, barely a month later, Gruveo brings official support for the upcoming Safari 11 on macOS and iOS to its web app. 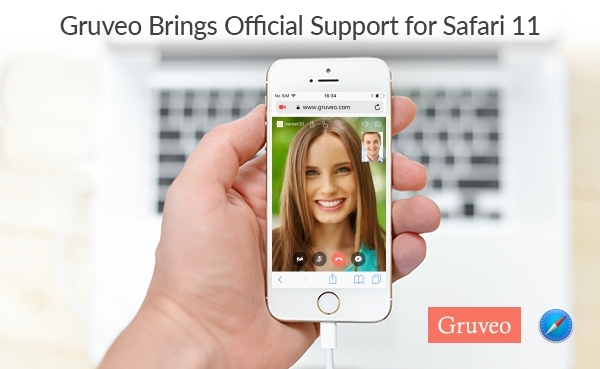 This means that after you update your iPhone or iPad to iOS 11 this September, you will be able to make video and voice calls with Gruveo by simply opening www.gruveo.com in Safari on your device. We have made sure that Gruveo works smoothly and reliably in the currently available beta versions of the new Safari. Unfortunately, Safari's implementation of WebRTC is only partial at this time. As a result, Gruveo may be downgrading the call to voice-only in some call configurations. When and if this happens, Gruveo will suggest alternative ways to ensure a smooth Gruveo experience on your device. Aside from adding Safari 11 support, we have ​also drastically improved support for the Temasys WebRTC plugin, which still provides a fully compatible Gruveo experience in Safari on macOS, including even older Safari versions. On the other hand, we are now dropping support for Internet Explorer 10 and 11, the latter of which was released almost four years ago. iOS 11 is expected to be released this September. Safari 11 for macOS will ship with the new macOS High Sierra (also expected in September), as well as the next macOS Sierra update, macOS 10.12.6. You can test-drive Gruveo in Safari today using the public beta of iOS 11 or by downloading Safari Technology Preview for macOS. We look forward to the official release of iOS 11 and Safari 11 for macOS so you can use Gruveo plugin- and app-free in Safari!